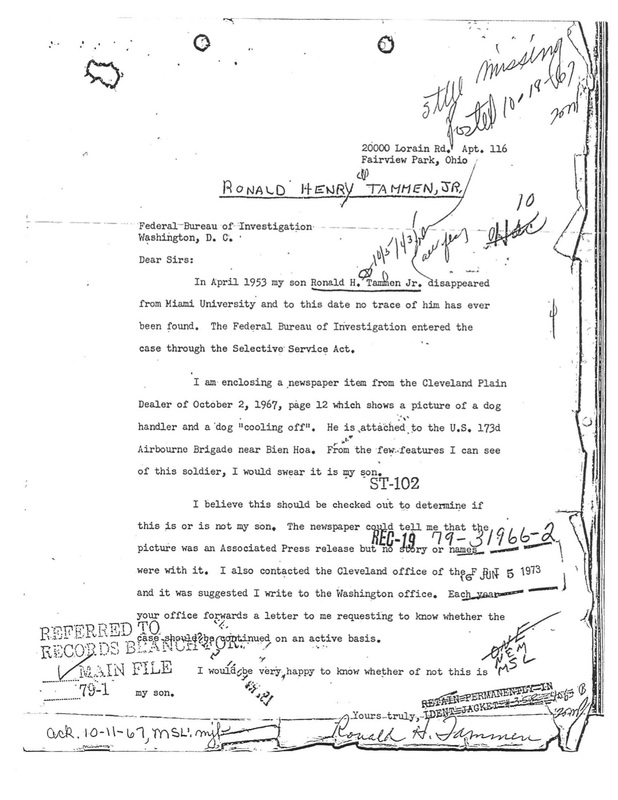 The dog handler, the dad, and the director - A Good Man Is Hard to Find - My Search for Ronald H. Tammen, Jr.
Let’s take a few steps back to the year 2010, when the FBI had sent me their first round of FOIA documents on the Tammen case. What do the FBI’s officially sanctioned records say and how might that information offer up some additional clues into the case, knowing everything else we know now? This is the initial report that was submitted roughly a month after Marjorie Tammen contacted the FBI informing them of her missing son. This form letter (as well as this one) sent by the FBI to Ron’s parents features the notations used to describe Ron’s fingerprints. 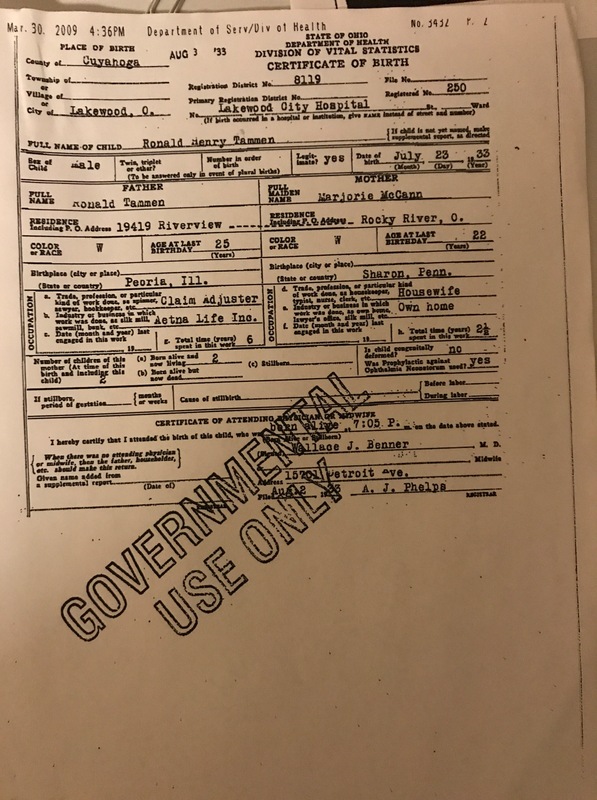 The document isn’t dated, however it references an Associated Press photo that appeared in the October 2, 1967, issue of the Cleveland Plain Dealer, as well as numerous other newspapers around the country. The photo was of a dog handler and his dog in Vietnam. COOLING OFF IN VIETNAM – A dog handler attached to the U.S. 173rd Airborne Brigade and his dog take a cooling swim in a stream near the unit’s home base at Bien Hoa, near Saigon. They had just returned from a patrol and both leaped into the water. Although I can see a resemblance, I have no idea if the soldier in that photo was Ronald Tammen, who would have been 34 at that time. However, the letter does tell me a couple things about Mr. Tammen. 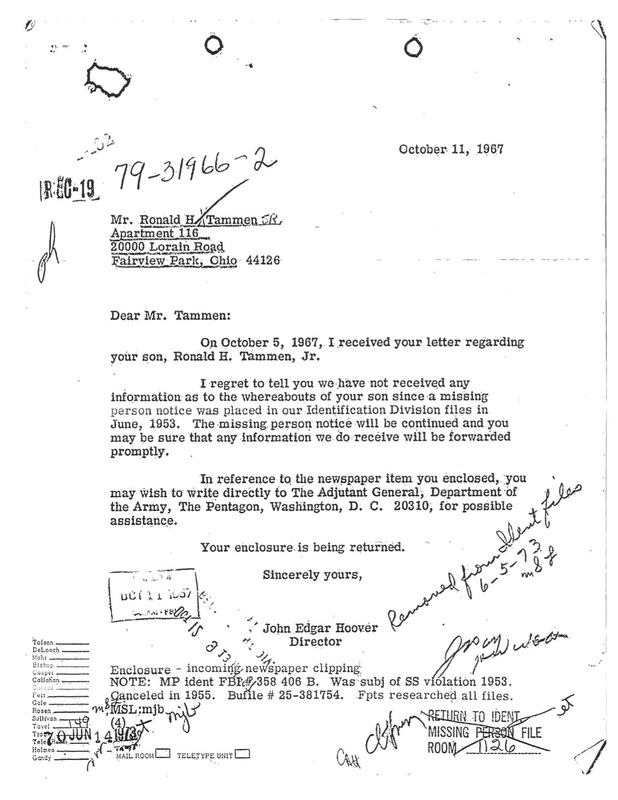 First, counter to the FBI FOIA liaison’s claim that Mr. and Mrs. Tammen thought Ron “to be deceased given some suspicious facts” (the FBI’s supposed reason for sending me the FOIA documents without requiring proof of death or third-party authorization), as of October 1967, Mr. Tammen was still hopeful that his son was alive. (Mrs. Tammen had passed away by then, in 1964.) Second, the letter shows that Mr. Tammen had no idea what had happened to his son. If any readers have been secretly wondering if Ron’s parents might have known something by that time, this letter should put those suspicions to rest. I’m going to go ahead and say it: That was one lame-o response, J. Edgar Hoover! Why do I think so? This was a disappearance in which the FBI had, at least at one time, more than a little interest. It was a case on which they’d staked their fabled reputation, one they’d sunk some serious tax dollars into, dispersing agents hither and yon to investigate what might have happened to Ron. Then, after 14 years with (supposedly) little to no new evidence, Ron’s father—someone who knew Tammen about as well as anyone could—writes in to tell them, Hey fellas! I could swear the person in this photo is my son! Can you check it out? Mr. Tammen hadn’t asked that much of the FBI up until that point. It wasn’t as if he’d been calling them once a week asking for an update. I’m no expert, but I’d call this a potential lead. That, Good Man readers, is what I would call a first-class, grade-A, top-of-the-line brush-off. If Mr. Hoover had truly been interested in finding out if the soldier in the photo was Ronald Tammen, don’t you think he would have made a phone call of his own to the Adjutant General? 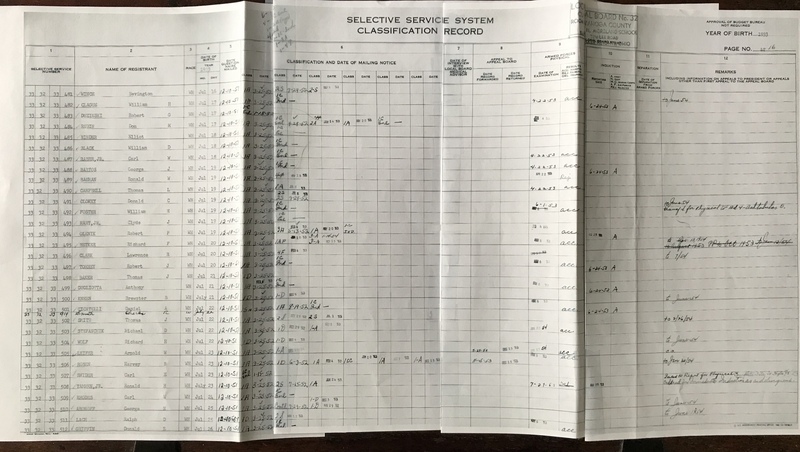 After all, in 1967, Tammen’s fingerprints were still on file with the FBI, and the Army obviously would have taken the soldier’s fingerprints when he enlisted. If the FBI didn’t already have the dog handler’s prints in their identification files (a big if), the Army could have sent them a copy, and, bada bing bada boom, question answered. But Hoover didn’t take that simple step. Why not? I’ll venture a guess. By 1967, I think Hoover had stopped caring about what happened to Ronald Tammen. Either that, or he already had a good idea what the answer was. And if it was the latter, there must have been some reason that he didn’t want that information to be made public. Congratulations! You’ve just completed post #20 of A Good Man Is Hard to Find. After reading some of the new details presented on this website, you may have begun forming an opinion of your own about what happened to Ronald Tammen—or maybe your opinion has evolved. If you wish to discuss your views, the floor is always open, and, at this stage of the game, there are no wrong answers. Also, don’t forget to share this blog with friends and family members! The more followers we have, the more people we can involve in the discussion, which could produce more leads and possibly more answers. My dad was in the navy and actually just missed Vietnam. I only vaguely remember this from when I was a kid, but he had a couple books from his time in the navy that were similar to yearbooks, with pictures of all the men in navy uniform. I don’t know if this was done throughout the military but it was around the same time so it’s possible that soldier is identified in one of those? Maybe! It’s funny–until now, I hadn’t even thought to look for the person, but you’re right. It’s doable. We know his role, we know he was attached to the 173rd Airborne Brigade, we know where he was stationed and when, and we know what he looked like. My hunch is that it isn’t Ron, but it might be fun to figure out who this person is. And we’d be going above and beyond what Hoover himself was willing to do, which is always gratifying. This one doesn’t do much for me. The FBI is not a monolithic organization personified by Hoover. So somebody writes in and gets a form letter back. I’m sure that happened countless times. Appealing to the FBI to find out who someone in a picture is, doesn’t strike me as the kind of thing the FBI would be all that inclined to do. And I don’t think the Tammens get credit for not bothering the FBI for 14 years. Some low level flunky would read that letter and respond in some noncommital way and I doubt bothered to check/notice it was the first communication in 14 years with the missing person’s parents. I doubt Hoover even read it before signing it. I doubt Hoover carried Tammen’s pick around like Joe Cella did. And finally, if there really was some FBI connection, surely Hoover would have put a little bit of disinformation into the communication. The fact he didn’t doesn’t make me think the FBI is hiding something. It makes me think they saw the letter from Mr. Tammen as a nothing burger. As always, I could be wrong. No problem. I totally get your point. It’s just that J. Edgar Hoover — and the FBI in general — were obsessed with fingerprints. They were advocating that every American citizen be fingerprinted for the very purpose of solving missing persons cases, along with identifying amnesia victims and unknown dead bodies. So here’s this guy who went missing 14 years ago whose prints they actually had on file and his father sends in a photo of a soldier who was also obviously fingerprinted when he enlisted. It would have been easy for them to compare the prints and to say, yes or no, was it Ron? But to not even make the effort seems odd to me. If there is anything I’ve learned about J. Edgar, it’s that he took pride in the FBI’s record in solving cases. To not do the bare minimum to perhaps solve this one seems uncharacteristic of him and the FBI. But you’re absolutely right. It might have been some low-level staffer who made the judgment call and JEH may not have even read the letter. Something more to ponder, I guess. Thanks for your comment! I copied the dog and soldier photo so I could take a closer look at it, sharpened it, and zoomed in for a close-up on the soldier’s face. The soldier appears to have a gap between his front teeth, which Ron didn’t have. His ear lobes look longer than Ron’s, and his chin appears to be rounder. I colorize old black and white photos as a hobby. If I were colorizing this photo, I’d color the soldier’s eyes blue or possibly green. They look quite light to me, much lighter than the shepherd’s eyes. My own eyes are hazel and don’t look that pale in black and white photos. I’ve only ever seen a few photos of Ron, but comparing the two, I’m pretty certain that the soldier in the photo is not Ron. I’m wondering how large the photo was when it appeared in the paper. I doubt if it was as clear as it is here. Thank you so much for providing your expertise in examining this photo! I agree with you that the soldier’s eyes look light. Ron’s eyes were hazel and appear darker in photos. Also, I hadn’t noticed the gap in the soldier’s front teeth before. As you’ve mentioned, Ron’s front teeth did not have a gap. In fact, they overlapped slightly, at least at the time of his disappearance. As for the size of the photo, unfortunately, I’m not able to bring it up in the online archives, however it was fairly large in the other papers in which it ran. But, again, as you point out, news photos, which are halftones, wouldn’t be as clear as this photo. They can be deceiving and some of the finer details can get lost. Thanks again for these observations. Previous Previous post: Did Ronald Tammen cross paths with Richard Colvin Cox?